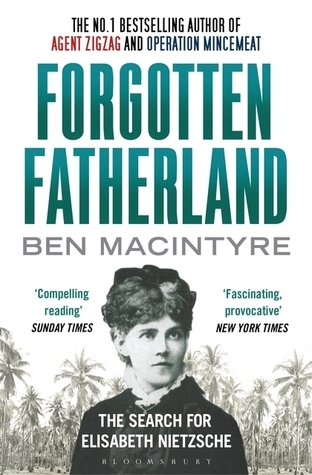 I came across Forgotten Fatherland in the Recommendations section of GoodReads (surprisingly good! ), and it instantly appealed to me, partly because it just sounded so weird that I needed to find out more about it. Essentially it is the story of Elisabeth Nietzsche, sister of the more famous Friedrich. I didn’t really know that much about Friedrich Nietzsche, but the name is at least a starting point to relate her to familiar history. Turns out she was a lot more influential than I realised – in her brother’s life, and in the fate of Germany. Elisabeth was many things, but she was most certainly a racist. She was also manipulative, self-serving, and arrogant. She became famous partly due to her brother and her connection with his work (which she practically re-wrote and branded as fascist – but more on that later), but also because she founded a German colony in Paraguay with her husband, Bernhard Forster. This isn’t that remarkable, since there were already several German colonies in South America in the late 19th century, but Elisabeth and Bernhard’s was unique because it was specifically founded with a view to preserving the ‘pure’ German race and protecting it from ‘mixed blood’. It was called Nueva Germania. Really. Luckily Ben McIntyre is a credible and good enough writer not to over-sensationalise the colony and its intentions. It is still amazing and slightly ridiculous, and this is nicely conveyed, with just a hint of a raised eyebrow, through the progress of the colony. It started off badly, and it got worse, with Bernhard descending into depression and madness, and the colonists becoming desperately poor. It is an utterly fascinating story, one I couldn’t quite believe was real. But the star of the story is Elisabeth, completely denying that her project was not a success, and convincing herself that she was to be some sort of queen, ruling over her group of pure Germans in their idyll. I don’t think it’s too much of a spoiler to say that Elisabeth did eventually return to Germany, partly because Friedrich was becoming more and more ill, and their mother couldn’t cope on her own. His illness doesn’t have a specific modern diagnosis, but from the evidence available, McIntyre surmises that it could have been a combination of the after-effects of syphilis, and the more widely accepted theory that he had some sort of cancer of the brain. This would explain his complete withdrawal from life, and his hours spent sitting staring into space. He also must have been, frankly, insane to let Elisabeth re-purpose his work and reputation for her own social gains. She presented herself as the guardian of her brother’s work and legacy, as if this was a noble venture, and used his renown to garner favour with the emerging National Socialist Party in the 1920s. Oh yes – she was friends with Nazis, with Hitler himself. The Party used this connection with the Nietzsche siblings as part of their campaign of preserving the German mind and spirit, and Elisabeth was more than happy for her brother’s work to be appropriated by these people. Crucially, she covered over his strong feelings against anti-Semitism, and made it seem as if his philosophical ideas supported the Nazis’ concept of a perfect German. Had he been compus mentus he would certainly never have allowed it. But Elisabeth convinced herself and everyone else that she was being a good sister, working to save Germany and preserve her brother’s work. Hitler probably never even read any of it. This is quite a dense book with lots of bit of information coming together to form the story, but it is presented clearly and you never feel muddled or lost. There are also some fascinating sections about the history of Paraguay, and the circumstances that allowed Elisabeth’s colony, as well as the reasons for its failure. Paraguay is a country I knew nothing about, so this was genuinely fascinating for me. Most people who have ruled it, up to that point at least, seem to have been a bit mad. I also loved the sections in which McIntyre recounts his visit to the colony in 1991, as part of the research for the book. As I read the history of the colony and its founding, I naturally wondered what had become of it. In 1991 McIntyre still finds Germans living there, some of them direct descendants of the original colonists. Most of them have never been to Germany, but fiercely protect their concept of Germanness – which is mostly that of Elisabeth Nietzsche and Bernhard Forster. I would have loved for the 2013 edition I read to have had some sort of update on the colony now. Perhaps McIntyre could write a follow up. He also includes photographs, both of the colony when it was formed, and as he found it, and of some of the people living there. The early German colonies, like Nueva Germania, were one of the reasons that many Nazis escaped to South America at the end of the Second World War. Arguably the most famous of these are Adolf Eichmann and Josef Mengele. On McIntyre’s visit he discovered that Mengele is a somewhat mythic figure in Nueva Germania, and many claim to have known or seen him in the years after the war. There is even speculation that he did not really die in 1979, and might still be alive. All of this is conjecture, but is in enthralling and grimly fascinating, like most of Nueva Germania. McIntyre points out that many people there might not even have know what Mengele did – he was just a famous German, a legendary figure in the fight for the purity of the German race, which of course all the people in Nueva Germania still believed in. On McIntyre’s visit in 1991 it was a surreal and slightly sad place – I wonder what it is like now. First published by Farrar, Strauss, & Giroux in 1992; the copy I read was published by Bloomsbury in 2013. Sounds a very interesting read. Mozart also had a sister. Apparently she was really talented too. Might try and read her biography.